Much of our research is focused on understanding the dynamics of fire regimes at relatively broad scales and using this information in ecosystem management. We employ quantitative analyses of fire occurrence patterns, examining the relative importance of different mechanisms that drive fire activity on the landscape. Not surprisingly, different factors exert their influence at different scales of space and time. The challenge is to analyze these mechanisms, and, to the degree possible, quantify trade-offs in their importance. A fire regime is a complex phenomenon, driven by a variety of biotic and abiotic factors. Fire is also one of the clearest examples of the linkage between “pattern and process” on the landscape. Over short timescales, fires generate spatial patterns of age classes and affect vegetation stand structures, all of which can feed back to alter the likelihood and behavior of future fires. Over very long timescales, fires affect patterns of species composition in ecosystems, which also feed back to influence the fire regime in question. Although a comprehensive list of publications can be found below, the following sections describe a few of the key areas of research in the lab. 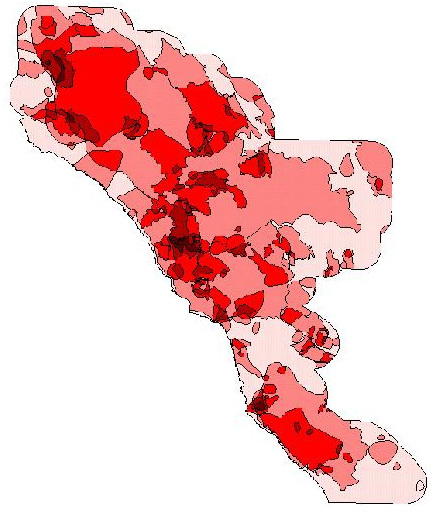 State-wide occurence of fires (in red) from CDF database, over Jepson ecoregions for California. A contested issue in fire research and management is often how modern human activities, especially recent fire suppression, have affected fire-prone ecosystems. In many forests that prehistorically experienced frequent surface fires, fire suppression has altered stand structure, resulting in the accumulation of fuels that can act as a “ladder” for fire to propagate into tree canopies. Large and intense crown fires in these ecosystems are therefore seen as relatively recent phenomena caused by human alterations to the natural fire regime. There is increasing interest, however, in what types of forested ecosystems would have consistently experienced frequent low-severity fires, as opposed to being mixed severity ecosystems (i.e., primarily surface fires, but with occasional higher severity patches or years) (e.g. Odion et al., 2004). In many of California’s chaparral-dominated shrubland ecosystems, there are several reasons why one might argue that large crown fires were prehistorically natural (if infrequent) events. 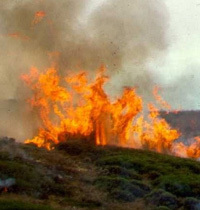 For one thing, shrubland fires are typically stand-replacing and of relatively high intensity. There are no “ladder fuels” to accumulate, as in many forested ecosystems. In addition, periods of extreme fire weather, such as the Santa Ana winds that impact parts of California, can drive fire through many age classes and vegetation types that might not otherwise readily burn. This trade-off between the influence of “fuels” (i.e., age and spatial patterns of vegetation) versus “weather” (i.e., episodes of extreme hot and dry winds) has been one of our most prominent areas of research (e.g., Moritz, 1997; Moritz, 2003; Moritz et al., 2004). Integrating these scientific findings into management and policy is an ongoing challenge (e.g., Keeley et al., 2004; Moritz, 2005). Mapping of Santa Ana wind patterns, as well as other forms of fire weather, is a new area of interest. Plants display a variety of adaptations and responses to fire-related stimuli, such as heat, smoke, and chemicals/nutrients in char. In addition, long-term fire patterns appear to relate to disease patterns, such as those of the pathogen Phytophthora ramorum responsible for Sudden Oak Death (Moritz and Odion, 2005). We are therefore pursuing several research questions about fire-related byproducts and plant ecology/ecophysiology. Global climate change is a key issue in fire research, although most seem to assume that a warmer planet means more fire. We know that cannot be the case, since there are different limiting factors in different places. For example, foliar moisture content in some evergreen shrubland ecosystems is an important control on fire probabilities, and this is strongly driven by spatial and temporal precipitation patterns (Dennison et al., 2008). Regardless, there are several “no regrets” steps that can and should be taken to reach a more sustainable coexistence with fire (Moritz and Stephens, 2008). As environments fluctuate, fire regimes appear to display some inherent natural ranges of variation, within which they operate as a functioning, complex system (Moritz et al., 2005). Although the mechanisms structuring fire-prone ecosystems are still actively being examined, common sense would dictate that there are limits to how much perturbation an ecosystem can accommodate, before it enters a new and fundamentally different state.